How’s your last Halloween? Was it fun enough? To have better Halloween, you should plan it in advance and recognize the traditions. 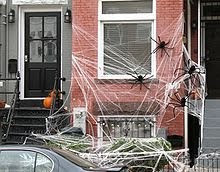 Having known Halloween traditions makes you can identify what ever you should prepare for. Halloween is celebrated once a year, on October 31. It has ancestry in the Celtic festival of Samhain and the Christian holy day of All Saints, but nowadays is mainly a secular celebration. There’s no Halloween without Jack O’Lantern! This carved pumpkin is linked largely with the holiday Halloween. 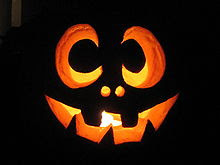 Usually the top of Jack O’Lantern is sliced off, and the inside flesh is dig out. You can carve on the pumpkin surface to make images, usually an outrageous face, and top is restored. At night, a light is put inside to light up the effect. There are some various legends about Jack O’Lantern. An old Irish folk tale told about Stingy Jack, a lazy yet clever farmer who used a cross to catch the devil. One story said that Jack trapped the devil into climbing an apple tree, and once he was up there, Jack quickly put crosses around the trunk or carved a cross into the bark, so that the devil couldn't get down. Unhappily, although Jack had passed away, his devil actions made him too sinful to go to heaven. However, the devil had promised not to take his soul, so he couldn’t go to hell, too. After that, Jack became known as Jack O’Lantern, roaming the earth eternally for a resting place. Wear Halloween costumes and attend costume parties. Since Halloween is celebrated only once a year, most people-perhaps included you- are willing to spend their times to find costumes that most suitable for them. Halloween is an enjoyable event and wearing costumes is fun for kids and adults, similarly. Halloween costumes for kids, it’s better to ask their opinion first, what kind of costumes that they really love to wear. Children in pre school age usually have had their own dreaming costumes. If your child is still below three years old, you don’t need to do this. Buying Halloween stuffs, whether adult Halloween costumes or kids ones, and Halloween Party supplies earlier will allow you to have many choices and great selection. Besides all that have been mentioned, you can do other interesting Halloween tradition activities such as trick-or-treating, ghost tours, bonfires, apple bobbing, visiting haunted attractions, telling scary stories and watching horror films. Well, there are months ahead until Halloween this year, you still have many times to plan the best Halloween ever!